Pirates is probably the most non-linear game I’ve ever played. That’s not to say that the game has no story; it does, and a very interesting one at that. In Pirates, you play a young lad who barely escaped the capture of his family by the evil Marquis de la Montalban. Now you are older, stronger, and a little wiser, and you travel to the Spanish Main to find fame, fortune, and to rescue your family. Something that generally sits well with me in any game is a variety of play modes. Super Mario Galaxy 2, Kingdom Hearts, and ChronoTrigger are just a few examples of such games. You have a general control scheme and play-line, but you also have other play-modes that you must learn to use as you transition from one part of the game to another. Pirates provides a similar experience. While many games would simply have you teleport from city to city, Pirates forces you to manually make the treks. 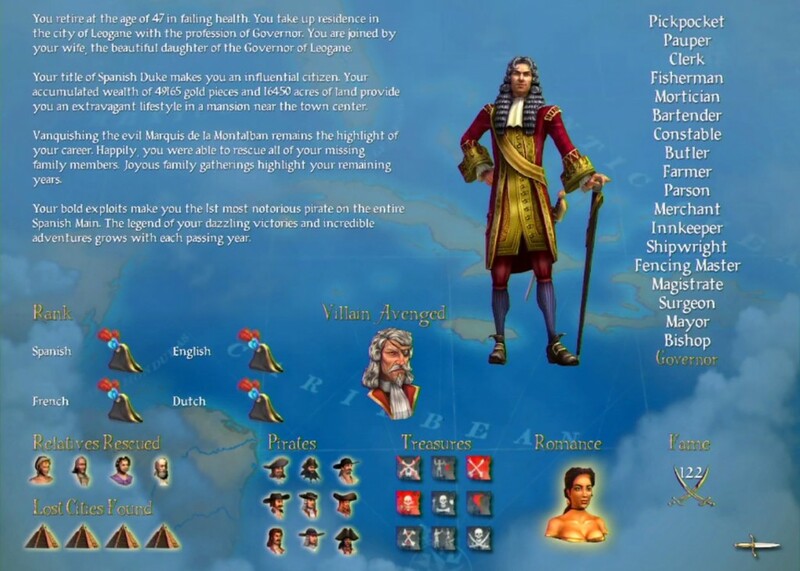 In Pirates, you must navigate the high seas, woo the governor’s daughters with dance and heroics, hunt down pirates and hidden treasure, and maintain diplomatic relations with four warring governments: the English, French, Spanish, and Dutch. New secrets and information can often be found in taverns, and the vast quantities of treasure can be seized at sea. But beware: spend too much time at sea, and you’re crew will become discontent and possibly mutiny. Like Batman: Arkham Asylum, Batman: Arkham City, and Kingdom Hearts, Pirates fits well into that niche group of games that allows you to work your way through a storyline while giving you the opportunity to stop short of completing the story in order to explore all other possible elements to the game. One could possibly use the (technically inaccurate) term “tantric” for this type of game; you work your way slowly through the experience, but delay its completion as long as possible in order to maximize the experience itself. As you can see in my final screen below, I took the time to (I believe) complete everything that could have been completed in this game, and I am pleased with the experience. This game, and the experience it delivers, has my highest recommendation.